Dr. Wendy Rudell, a native Canadian and resident of the USA is a world traveler who spends as much time as she can in Cabo San Lucas, Mexico. For the past 40 years, Wendy has been actively involved in the healing arts and holds degrees and certifications in the following: teaching, naturopathy, biofeedback, coaching, breathwork, yoga, massage therapy, colon therapy, hypnotherapy, spiritual counseling, aromatherapy, quantum touch, live food nutrition and much more. 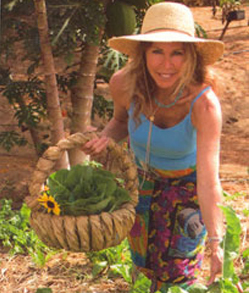 Wendy is a published author of a raw food cuisine uncook book titled “The Raw Transformation: Energizing Your Life with Living Foods”. Wendy holds a Bachelor’s Degree in Health Sciences and a Doctorate in both Traditional Naturopathy and Alternative Medicine. She is presently an ongoing student at IQUIM University (International Quantum University for Integrative Medicine) and is writing her thesis for her PHD in Integrative Medicine. After working as head chef of a large vegetarian restaurant in British Columbia, Canada, and attaining a teaching degree from Notre Dame University, Wendy traveled to Hawaii where she became a coordinator and instructor for the Pritikin program on Maui. This nutritional program focuses on reducing the effects of degenerative diseases. From 1984 to 1990, she owned and operated a raw food product manufacturing and distributing company on the the island of Kauai. Returning to the continent, Rudell studied Hatha yoga at the Vancouver Yoga Institute and later studied Ashtanga yoga with Patabe Joyce from India. She graduated from the Arica Institute (mystery school for expanding levels of consciousness) as a trainer and participated in leading training in both New York City and Mexico. Wendy studied Massage Therapy in Hawaii where she then practiced for twelve years. She also worked as a qualified colon therapist, gourmet raw food chef, and yoga instructor at the Tassa Hanalei Retreat Center on Kauai for approximately three years. Wendy’s journey has always involved searching for higher truths, mastering skills and acquiring knowledge that would eventually lead her to her present work as a Traditional Naturopath, Quantum Biofeedback Specialist and Healer. Wendy’s passion is to assist others to achieve optimum health and wellness on ALL levels. Wendy presently holds a Doctorate Degree in Traditional Naturopathy and a Doctorate Degree in Alternative Medicine from IQUIM University (www.iquim.org) and is presently working on her PHD in Integrative Medicine. At the Optimum Health Institute (cleansing and detoxing with live foods and juicing) in San Diego, California, Rudell implemented a complete program of lifestyle changes designed to teach guests how to continue to live a raw foods lifestyle when they returned home. This included teaching gourmet raw food classes, theory and application, breath work, yoga, meditation, and nutrition. Rudell believes in being Happy, Healthy and Free. As a practitioner whose understanding of health and wellness is based on the principals of quantum physics Wendy helps others take responsibility for how they are collapsing consciousness for themselves through the more subtle energetic bodies (mental/emotional/vital) which then show up in the physical. In very simple layman terms Wendy explains how “Consciousness” is the fundamental reality of everything in the Universe. It is called by other names such as Spirit, God, Higher Self, Budda or The Christ consciousness. Wendy also addresses the categories of health relating to the physical body, these being assimilation / elimination / immunity / oxidation / and regeneration, what she calls the five pillars of health. She uses the ” INDIGO” quantum biofeedback device to see if there are stresses in these areas and then with an integrative approach Wendy coaches each person in finding a healthier lifestyle that works for them. This may include super-nutrition, dietary and lifestyle changes, biofeedback retraining sessions, EFT, NLP, nutritional supplementation, homeopathic formulas, herbal remedies, tonics, medicinal plant oils, detoxification protocols, bio identical hormone balancing, colon health, massage therapy, hypnosis, quantum touch, live food nutrition, breath work, Scaler Wave therapy and much more. Wendy has been developing a wellness retreat and community project on her thousand acre ranch at the base of the Sierra de La Laguna mountain ranch, one half hour drive from San Jose. She will be conducting exclusive retreats commencing in the fall of 2014. Please refer to the calendar of events for retreat dates and types if interested. All retreats will be based on Live Food nutrition and instruction, with different focuses. For example: Healing Diabetes, Detoxification, Liver Cleanses, Yoga, Breath Work, Wellness retreats, Athletic Performance retreats and retreats designed for individual groups. If you have an interest please feel free to contact Wendy at wrudell@yahoo.com and fill out the sign up form on this website.